Tony DiLeonardi. New York: Morgan James Publishing, 2018. 138pp. Summary: Legacy Letters is a short story of a family who is overwhelmed by health concerns, and educational and financial stresses. The consequences are similar to other American families and communities, where relationships are strained by unfocused anger brought on by political divide and lack of trust in our institutions. According to DiLeonardi, this book attempts to provide solutions by revisiting age-old virtues that have stood the test of time and turn them into practical principles. Professional money manager Jim Peters, a committed husband and father of three, is experiencing lack of self-confidence. He believes his family’s well-being and his dreams are in jeopardy as he is being pushed out of his job by unscrupulous competition and younger, tech-savvy workers. On the brink of making costly decisions, Jim believes he will lose everything that is important to him. He is battered by the institutional influences over his life. Jim, however, is about to discover an old way of living that will create a new way of thinking—and it will come from an unusual place. Through a series of recently discovered old letters, Jim travels through time. Along his journey, he learns how to create good health, true wealth, and genuine wisdom. Jim and his wife, Marilyn, make this journey together. 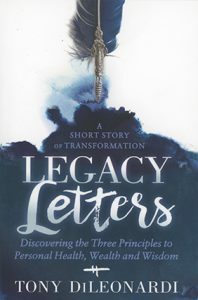 For example, about halfway in Legacy Letters, we see them creating a summary of their letters and how to achieve health, wealth, and wisdom, using three principles for each attribute. Health: master thankfulness, choose forgiveness, and create community. Wealth: build discipline, learn contentment, and discover purpose. Wisdom: seek perspective, train thinking, and fill your mind with beneficial content. As a result, Jim (and by extension, the reader) regains control of his life and helps transform the lives of his family, friends, colleagues, and community. Legacy Letters is a story of personal responsibility and encouraging real outcomes. Discussion questions at the end of chapters can guide the reader to his/her own discovery. About the Author: Tony DiLeonardi ’80, M.S. ’81, is the founder of Third Quarter Advisers, a firm dedicated to helping leaders improve their organizations’ health by offering coaching services and solutions. He is a frequent keynote speaker. He is the author of Face to Face: Creating Lifelong & Multi-Generational Clients (press release). He currently resides in Wheaton. Licia Johnson. Mustang, OK: Tate Publishing & Enterprises, 2010. 64+pp. Licia Johnson. Bloomington, IN: WestBow Press, 2017. 80pp. 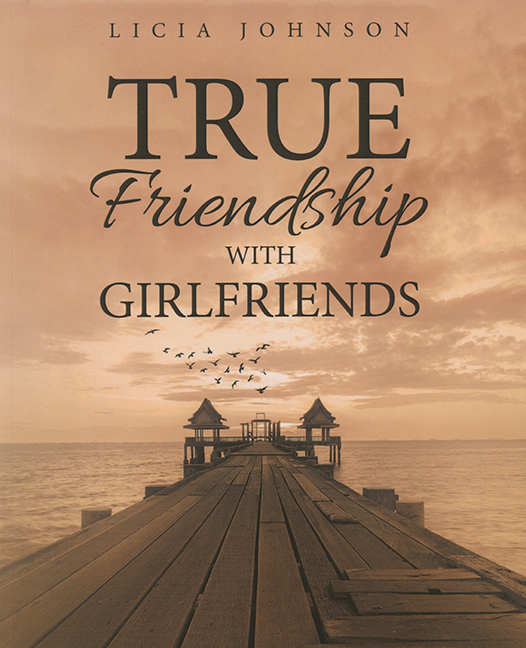 True Friendship with Girlfriends is Johnson’s second book. The narrative follows the relationship between Columbia College freshmen Kendra and Aubrie. Johnson begins with the definition of friendship from Wikipedia, which she uses as the basis for describing Kendra’s relationships. Johnson develops her theme through extended conversations between Kendra and the other young women she encounters through her years at Columbia. 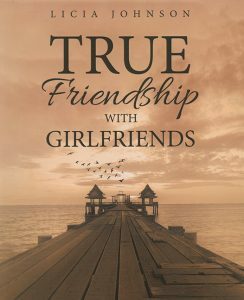 Johnson explains her raison d’être for writing True Friendship: “Reader(s) will be interested in my unique voice because I keep it simple, funny and real. … Most of my stories are loosely based on my life. Names and such are changed. Things are added or taken away from the true story line” (back cover). About the Author: Licia Johnson ’98 lives in Chicago and works in the banking industry. Tammie M. Kennedy, Joyce Irene Middleton, and Krista Ratcliffe. Carbondale: Southern Illinois UP, 2017. 358pp. 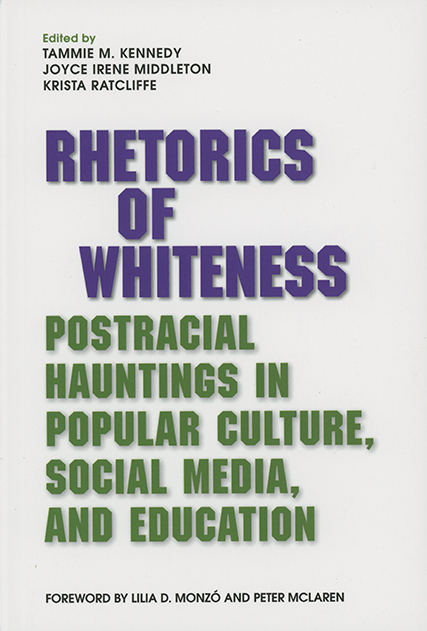 In order to address this broad audience, the 16 essays are organized into five parts, which the editors say “identify and rhetorically analyze cultural sites haunted by whiteness.” They are: 1) Hauntings in Popular Culture, 2) Hauntings in Social Media, 3) Hauntings in Education, 4) Hauntings in Pedagogies, and 5) Problems Haunting Theories of Whiteness. An Epilogue by the editors concludes the book, with a List of Contributors and a detailed Index. The Works Cited at the end of each essay leads readers to sources pertinent to that particular focus. The editors placed their topic into mainstream U.S. discourse when, in the fall of 2014 as contributors were revising their essays, Michael Brown was killed in Ferguson, Missouri. “In an odd synergy,” the concept of whiteness appeared in movie theaters (the film Dear White People) and on a Pinterest board, among other places. In early 2015, as they finished their Introduction, the editors noted other mainstream discourses on whiteness: the film Selma, an NPR program, FOX News, the Oscar show. Whiteness has reemerged during the last 10 years as a racial identity marker overlapping politics, law, education, social media, entertainment, as well as journalism. 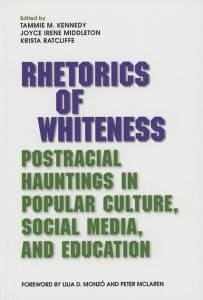 Though Rhetorics of Whiteness is clearly aimed at an academic audience, the discussions in individual essays are pertinent to all aspects of contemporary U.S. culture. About the Co-Editor: Tammie M. Kennedy ’87, MS ’95, is an associate professor of English at the University of Nebraska Omaha. She was a recipient of the CCCC (Conference on College Composition and Communication) Outstanding Book Award for Rhetorics of Whiteness at the organization’s 2018 annual convention. Kennedy’s previous publications include articles in the field of rhetoric and composition, as well as rhetoric and memory. 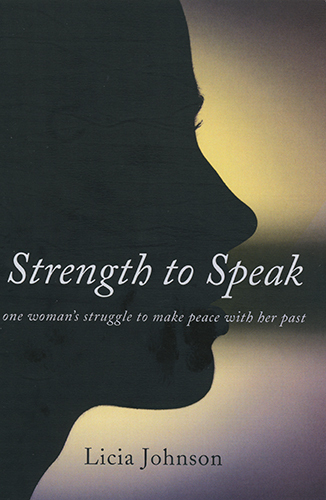 She currently is the editor of the Women’s Archive Project (WAP) at the University of Nebraska Omaha. Becky Sarwate and Randy Richardson. Chicago: Eckhartz Press, 2018. 178pp. 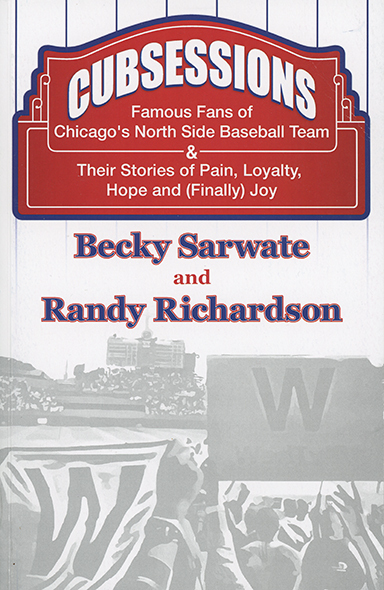 Summary: Randy Richardson’s love affair with the Chicago Cubs began when he was a third grader in a south suburb of Chicago, a Cubs fan marooned in a sea of White Sox fans. He realized in 1974 that the team didn’t make it easy to love them, yet this 12-year-old did. And that love affair has continued, as is clear to anyone reading Cubsessions. Richardson’s co-author, Becky Sarwate, also is a longtime Cubs fan, a family trait from her “Cubsessive” father. “We are emotionally tied to them, much like family,” confess Sarwate and Richardson. Begun after the Cubs’ glorious 2016 season, Cubsessions is published by Eckhartz Press, one of whose goals is to concentrate on Chicago authors, stories, and audiences (voyagechicago.com). This geographical and cultural emphasis certainly applies to this lively and interesting anthology. Cubsessions consists of summaries of interviews the authors conducted with Cubs fans, many of whose names readers will recognize. Some were born with Cubbie blue running through their veins; others decamped from another team. “Whether they are famous for acting, joke-telling, broadcasting, writing, cooking, pitching, or cheering, when you peel away those tags for which they are best known, they are just like me and you. … They are Cubs fans,” contend Richardson and Sarwate in their Introduction. A photo section midway through the book features many of the people whose reminiscences are the substance of Cubsessions. Interestingly, all are photographed at Wrigley Field or with Cub-related items. We see, for example, journalist Jonathan Alter and his son at game 5 of the World Series; comedian Tom Dreesen as a batboy at Wrigley Field; actor Bob Newhart and his family in front of their fireplace holding a W flag; and, among many others, Sam Sianis with his pet billy goat. I love the Cubs, says Sianis, “because they are Chicago. And Chicago means everything to me. Loving the Cubs means believing.” Any Cubs fan browsing the essays in Cubsessions will know exactly what he means. About the Co-Author: Randy Richardson ’85 is an attorney, award-winning journalist, and founding member of the nonprofit Chicago Writers Association. He was the first male recipient of the National Federation of Press Women’s Communicator of Achievement Award. Richardson’s essays have appeared in several collections. His previous books are novels: Cheeseland and Lost in the Ivy. A die-hard Cubs fan, he lives in Chicago not far from Wrigley Field.